Being A Woman Will Be Easier on August 1st! Women who earn minimum wage are struggling to make ends meet. The current minimum wage at $7.25 an hour can not support our families. If you support raising the minimum wage sign this petition today. What would raising the federal minimum wage do? Rebuild our economy. For every $1 added to the minimum wage, low-wage worker households spend an additional $2,800 the following year.Ensure a better future for our children. 21.5 million children have a parent who would benefit from a minimum wage increase. Increase jobs. Increasing the minimum wage would boost consumer spending, which drives 70% of our economy. 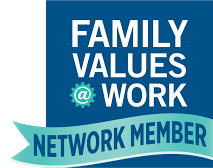 Sign this petition today because we deserve the opportunity to work hard and earn enough to support our families! 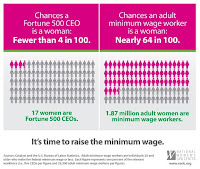 For more information on the benefits of increasing the minimum wage please check out the National Women's Law Center fact sheet. From our friends at 9to5. Excellent communication, organizational, computer and interpersonal skills required. Previous experience with fundraising, proposal writing, marketing, journalism, public relations, and coordination of special events is preferred. Ability to manage agency website and supervise development/communication interns within the development team. Prefer experience with Gift Works software. Bachelor’s Degree required. E-mail or fax cover letter and resume to: LD/FF 610-328-2807. Tonight the Opening Ceremonies for the Summer Olympic Games takes place. For the next few weeks, all eyes will be on London as athletes from all over the world compete in events from archery to soccer. This year is particularly exciting for women. It is the first Olympics where all participating nations will be sending women to compete. In addition, it is the first year that the US Olympic team will include more women than men. The 1900 Olympics were the first where women were allowed to compete when lawn tennis, croquet, and golf were introduced. Since 1900 women began to participate in more events and dominated many of them. With the introduction of women’s boxing this year, there are no Olympic events that are exclusively for men. We look forward to seeing team USA compete and will be cheering on all the men and women! Twenty two year ago today Congress passed the Americans with Disabilities Act (ADA), legislation aimed to improve the lives of people with disabilities. 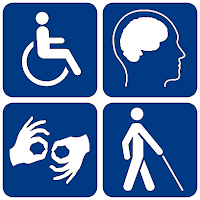 The law protects individuals with disabilities when it comes to employment, public accommodations, transportation, and public services. The law has provided for things from curb cuts to protections from discrimination but there is still more work to be done. For example, right now employment for people with disabilities is lower than it was before the passage of the ADA. While more needs to be done to remove barriers for people with disabilities, today is a day to be thankful for all the ADA has done and the promise it has for the future. The Violence Against Women Act (VAWA), enacted in 1994, was the first piece of American legislation that recognized the pervasive nature of domestic violence, dating violence, sexual assault and stalking. VAWA programs give law enforcement, prosecutors and judges the tools they need to hold offenders accountable and keep communities safe, while supporting survivors and recognizing their role in the fight to end gender-based violence. VAWA needs to be reauthorized to ensure the continuation of these vital, life-saving programs and laws. In addition, this is also an opportunity to expand VAWA by improving services available to LGBTQ survivors of violence, breaking down barriers to services for undocumented survivors, and continuing prevention efforts to counter the high levels of violence against Native American and Native Alaskan women. If you support VAWA please sign this letter that was put together by the National Task Force to End Sexual and Domestic Violence (NTF). Countdown To Coverage Event: Being a Woman Will Get Easier on August 1st! This spring marked the second anniversary of the new health care reform law and Raising Women's Voices of Southeastern Pennsylvania, a coalition PathWays PA is a member of, celebrated by launching the Countdown to Coverage campaign! This campaign is aimed at helping women understand the concrete ways that the Affordable Care Act is making it easier for women to get the services we need to stay healthy throughout all life stages and across all socioeconomic levels. We are currently counting down to an important milestone for the health care reform law, and more importantly, for women. Starting on August 1, all new insurance plans will have to start covering important preventative health services for women, such as contraception, screening and counseling for domestic violence, annual well-woman visits, and breastfeeding supports, without charging co-pays. Expensive co-pays are a major barrier for women and can prevent us from getting the care we need. Women who earn minimum wage are struggling to make ends meet. The current minimum wage at $7.25 an hour can’t support our families. It's time to raise it to a wage that can. Sign a petition today asking your elected officials to support hard working men and women by increasing the minimum wage! Rebuild our economy. For every $1 added to the minimum wage, low-wage worker households spend an additional $2,800 the following year. Ensure a better future for our children. 21.5 million children have a parent who would benefit from a minimum wage increase. Increase jobs. Increasing the minimum wage would boost consumer spending, which drives 70% of our economy. Sign a petition today because we deserve the opportunity to work hard and earn enough to support our families! August 1 is an important milestone for health care reform law, and more importantly, for women. Why? 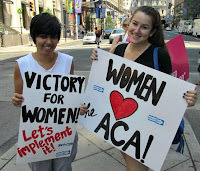 Because starting August 1, 2012, the Affordable Care Act is making it easier to be a woman. Contraception Screening and counseling for domestic violence Annual well-woman visits Breastfeeding supports, such as counseling and equipment (including rental of breast pumps)Screening for gestational diabetes HPV testing STI counseling HIV screening and counseling Expensive co-pays have been a major barrier for women in accessing the care we need. In fact, more than half of women have delayed or avoided preventative care because of its cost. This Wednesday a group of voting rights groups, led by the ACLU, will be seeking an injunction from Pennsylvania’s Commonwealth Court to prevent the state from enforcing the Voter ID law. The ACLU and its allies will argue that the law will prevent legally registered voters who are unable to obtain one of the accepted forms of identification from casting ballots. It's a burden, they have found, that falls disproportionately on groups like the elderly, low income and minorities. The decision on the case is expected be in 5 to 7 days but no matter the outcome it is likely the case will be appealed to the State Supreme Court. In addition, the US Justice Department has opened an investigation into Pennsylvania’s Voter ID law. They have requested information so they can evaluation the law’s compliance with the Voting Rights Act and other federal voting rights laws. Last week, the House Appropriations Committee released a draft of the Fiscal Year 2013 (FY 2013) Labor-HHS-Education Appropriations. The bill passed out of the subcommittee by a vote of 8 to 6. Overall the bill cuts more than $6 billion in discretionary funding from current levels. The majority of programs are flat-funded at current levels, but there are some notable increases and decreases. The SIL Case Manager will have at least three years experience providing direct services to teen parents and their children. Individual shall possess the ability to identify with and adapt to the goals and philosophies of the agency and the program . Familiarity with the concepts of strength-based practice. Mature individual with the knowledge of the skills necessary to live independently. Candidate shall demonstrate empathy, flexibility, perseverance, and team orientation. BSW or related Bachelors Degree required. Please e-mail or fax resumes to: LD/BD at 610-328-2807. Family Medical Leave Act – What Does it Mean for You? At PathWays PA we receive many questions from the community about their rights as workers. To help answer some of these questions we thought a series of blog posts explaining some of those rights workers have would be helpful. We are starting with the Family Medical Leave Act because it is one of the topics we are asked about most often. Under the Family Medical Leave Act (FMLA) eligible employees are able to take unpaid but job protected leave for certain life events. During the leave the employee has the right to remain on the employer’s health insurance and upon return they have the right to be restored to the same or an equivalent position. FMLA applies to public agencies, all public and private elementary and secondary schools, and companies with 50 or more employees. Employees of these entities are eligible for leave if they have workeds for their employer for at least 1,250 hours over 12 months. The Daily News recently published an editorial looking into the facts about food stamps and how it impacts Philadelphia. Right now Congress is considering the reauthorization of the Farm Bill, which includes fund for the food stamp, or SNAP, program. The House Agricultural Committee passed a bill out of Committee that cuts $16 billion from the program. If that bill becomes law 2 to 3 million people would lose their food assistance and 280 million children would no longer qualify for free school lunches. In the United States 1 out of every 7 and in Philadelphia 1 out of every 4 people are struggling with hunger. Next week, Pennsylvania plans to hold a $363.6 million sale to re-fund general-obligation bonds. That plan continues to hold even after Moody's downgraded the state's credit rating yesterday from Aa1 to Aa2 and rated the bond sale at Aa2. Moody's outlook on Pennsylvania also changed from "stable" to "negative" based on the state's weakened financial position and slow movement towards growth in the state economy. Pennsylvania has been rated Aa1 since 2010, but now joins 16 other states at Aa2 or below. Moody's said its decision was based on “Large and growing pension liabilities and moderate economic growth will challenge the return to structural balance, contributing to a protracted financial recovery.” Financial reports show that Pennsylvania's retirement systems do not have enough money to meet projected liabilities. Congressman Richard Neal is introducing a bill to continue the Child Tax Credit and the Earned Income Tax Credit in their current form for another year. In 2010, the Child Tax Credit and Earned Income Tax Credit together lifted 9.2 million people out of poverty, including 4.9 million children. The improvements now scheduled to expire kept 1.6 million of these people out of poverty. For more information, see the Center on Budget and Policy Priorities' Studies Show Earned Income Tax Credit Encourages Work and Success in School and Reduces Poverty. Organizations that support these program are being asked to show your support. All you have to do is to send an email to one of the following people by noon, Tuesday, July 17, saying that your organization (local, state, or national in scope) can be listed in support. Email Adam at Larose@cbpp.org or Stuart at Russell@cbpp.org. The Gleitsman Citizen Activist Award honors those who have struggled to correct social injustice in the United States (international activists will be the focus of our award in 2013). A total of $125,000 will be awarded in 2012. An honoree, or the honorees, will also receive a specially commissioned sculpture designed by Maya Lin, creator of the Vietnam War Memorial in Washington, DC. The Gleitsman Program is now accepting nominations for the 2012 Citizen Activist Award. To nominate an individual, please complete the online form or PDF version and submit it to the selection committee along with the requested supplemental material by July 16th. The winner will be announced this fall. Please note that the award is not presented posthumously, nor is it granted to groups or organizations. Self nominations cannot be considered. The federal minimum wage has not been increased in three years. During that time, the price for our basic services have gone up and made it harder for a family to sustain itself. It's time to increase the minimum wage and help the working class. On Tuesday, July 24, at 4 pm, you can meet Fight for Philly at the Liberty Bell for a march to Love Park. For more information, contact Che at che@fightforphilly.org. The Budget is Done - What's Next? With just a few minutes to spare on Saturday night, Governor Corbett signed the budget for the 2012-2013 Fiscal Year, which began on Sunday, July 1. You can find a final copy of the budget at http://www.portal.state.pa.us/portal/server.pt/community/current_and_proposed_commonwealth_budgets/4566/. Also, the Pennsylvania Budget and Policy Center will be holding a phone call next week to discuss the budget. Even though the budget debate is over, there are plenty of issues to take action on. Please take a moment to make calls, write emails, and provide overall support for the issues that matter to you. Earned Income Tax Credit outreach initiatives throughout the state, including our work at PathWays PA, are at risk of losing their funding from DPW in this fiscal year. These initiatives are not line items in the state budget, so we do not yet know the final funding determination. Over 2000 families filed returns just with PathWays PA this year, giving them access to free, IRS-certified tax services, financial literacy tools, and quick refunds without paying high interest fees. "Outreach around the Earned Income Tax Credit, a program for working families, is at risk in the Department of Public Welfare. Will Senator/Representative X call or write to Secretary Alexander asking for the continuation of the program?" Ensuring women are prepared to succeed in a 21st century changing economy is critical to the financial stability of women, their families, and our country. Why Green Is Your Color: A Woman's Guide to a Sustainable Career (from the US Dept. of Labor Women's Bureau) is a comprehensive manual designed to assist women with job training and career development as they enter into innovative and nontraditional jobs.